<firstimage=”//static.makeuseof.com/wp-content/uploads/2011/05/23.png”> That smartphone sitting in your pocket or on your desk right now is actually a computer. Of course, you already knew that. But what kind of a computer is it, exactly? What are its specifications, how much RAM does it have, what kind of sensors are on-board and what do they mean? If you’ve ever wondered about any of these things, Elixir for Android has the answers you’re looking for, and much more. Turns out Acer is dubbed the Liquid E “Salsa”. Quite an interesting moniker for such a humble smartphone. Oh, and yes, I’ve got a Liquid E, and now everybody knows. Don’t worry, my other phone is a Galaxy S.
This may seem like tedious, nerdy information, but if you’re ever trying to solve an issue with a custom ROM, it can come in very handy. You can have someone else who isn’t having the same issue tell you if you’re both running the exact same build or not, for example. Or file a very specific bug report that makes it clear you really know what you’re talking about. Anything and everything you ever wanted to know about your battery is right here. While this particular information is also available via the built-in Battery Info setting, it’s very handy to have it alongside all of the other system specs. When you tap it, you get a slider for each and every volume setting. This app really cuts no corners. Elixir goes so far as to tell me the exact make and model of the orientation sensor in my device. I’m not sure why would I ever need this information, unless I was trying to fix the device myself and actually solder a new component onto the board. Note that the other properties (Version, Resolution etc.) are not provided by the sensor. The battery meter is a bit superfluous for my phone (I’ve got a decent one built in) but the CPU usage meter is an interesting touch. I won’t be using these personally, but if your notification area isn’t too cluttered these can be worthwhile additions. This is Go Launcher’s Add Widget dialog. As you can see, Elixir dominates the list. By default, all widget types are enabled, and Elixir takes up 19 lines (!) of the available widget list. Naturally, Elixir lets you disable any widget types via its Settings screen, so you can bring this down to a much more manageable list (say, one or two widgets). This particular widget shows device memory status, battery temperature, CPU frequency, cell signal strength, WiFi status toggle, device auto-rotation toggle, and screen-lock toggle. That’s seven buttons that fit in what would normally contain just four buttons. It’s literally packed with functionality. The buttons are small but are still quite easy to hit. The screen-lock button requires special permissions (from the Options screen), but even after I granted them, it did not exactly work right on my system. I think that’s due to a conflict with No Lock. How did you get the status/notification bar across the bottom instead of the top of the screen? Also, yes, this app is very much a keeper. That comes with my ROM, the stock Acer 2.2 ROM for the Liquid E. :) And I'm glad you liked the app! I always wondered if something like this is available for Android phones but couldn't find one with these features. 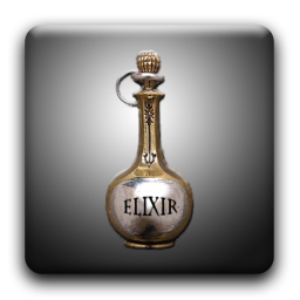 Looks like 'Elixir' is a keeper. What ROM/Theme are you running? I've got an Acer Liquid E (don't buy one! Currently waiting for my Galaxy S to come in), and the theme is Acer's own theme for Froyo. I mean, it's their Froyo build. Not that it's a bad device, but it's got a tiny memory. If you don't need many apps (and are not an Android blogger..) it's a nice device. What is the name of the background or theme you are using on your droid? I wantz it! Sure thing. :) Don't forget to paste a screenshot of your config once you've got something nice going! Small tip: Put your widgets/icons only on the bottom half of the screen, and then enable the Windmill transition effect in Go Launcher (Preferences > Display Settings > Transition effect). It looks quite swanky, because you flip, and only the bottom half of the screen rotates (because the top is just your wallpaper).